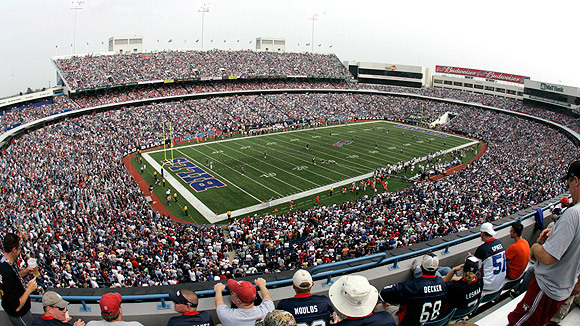 It’s the elephant in the room when it comes to discussing the future of the Bills in Buffalo. Finding a solution to where the Bills will be playing their games for the foreseeable future has presented a myriad of questions, proposals and debates throughout Western New York and it doesn’t appear we’re collectively closer to a final answer than before Ralph Wilson passed away. The Buffalo News has been the most active in covering various plans and potential owners involved in the saga. They’ve done everything from profiling potential owners to scouting potential stadium sites. Outside of the News’ coverage, it appears as if there is a small handful of locations that have made the unofficial shortlist when it comes to the Bills home turf. Keeping the team located in Orchard Park has been a popular topic along with spots in and around the Perry Projects, the Outer Harbor and even Niagara Falls. That group, to me, appears to be the most popular at this point in time. Other spots like Scott Congel’s land in West Seneca, Batavia and others have come up, but it seems as if they’re all extreme long shots. What’s interesting is how the stadium project will factor into the mix with potential owners as well. Tom Golisano, Donald Trump or perhaps even Jeff Gundlach may have the funds to make a competitive bid on the franchise, but do they have the scratch to finance enough of a stadium to limit the need for PSLs – something that’s widely accepted as a non-starter given WNY’s economy? Terry Pegula, on the other hand, has the funds available to go off and buy the team and build the stadium without even searching for public assistance considering his vast wealth. In fact, you could argue that the $1.75 billion he made in his recent land sale is nearly enough to cover the costs associated with purchasing the team and building a new home in one fell swoop. The various scenarios that can and will play out surrounding the potential owners is a lengthy conversation in and of itself. Placing the primary focus on what seems to work best in terms of a stadium without taking into account future influences from ownership is the point of this post. I’ve been on record voicing my support for a great number of options. At one point I saw the Outer Harbor as a simple solution but I’ve since backed off from that theory. I certainly support the idea of saving the public (and owner) any major costs by putting a serious renovation effort into the Ralph but I’d also love to see a perfect storm converge to see a new stadium built downtown. Donn Esmonde felt that he should offer his opinion on the matter and managed to look at every aspect of the scenario in the wrong way (as he usually does). Without going full-on FJM on Esmonde’s column, it’s important to understand that the Bills are well aware of the market they’re trying to sell suites to. They have removed end zone suites in recent years and would most certainly be communicating this information when the conversation on a new stadium begins. Short of breaking into a full diatribe on how the stadium should be built, I’d rather consider the pros and cons surrounding the most popular sites that have been mentioned to this point. There’s plenty of land and a willingness from a number of parties to make this a serious contender as the team’s future home. There are more than a few points of contention surrounding Niagara Falls as a potential location. These include the inevitable “they aren’t the Niagara Bills” arguments along with concerns being raised over the bottlenecks that are the Grand Island Bridges. While the former is something of a fruitless argument, there is something to be said over the potential traffic issues that could be created should the stadium be located in downtown Niagara Falls. However, my biggest argument against this site has little to do with the traffic concerns and more to do with the expected impact on Niagara Falls and for Western New York as a whole. Capitalizing on the money spent by Canadian fans who travel to Bills games is going to be a key factor in any potential plan. As it stands now, most fans trek to Orchard Park, drink and then trek home. There is little to do around the stadium now and unless those fans are staying overnight, it’s unlikely they’re finding their way into the city. I’d argue that moving the stadium to Niagara Falls would do little to improve upon this situation. In fact, it could actually harm the economic impact of those fans. Placing the stadium a stones throw from the border crossing and Niagara Falls, Ontario will more than likely draw Canadian fans back to their native soil the moment games end. Why spend money in a city that still needs to see more economic development when the Canadian Vegas is just across the bridge? I’m willing to bet that you’d see scores of fans going across to the Canadian side of the Falls rather than sticking around the US side should a stadium wind up there. Couple that with the assumed traffic headaches for local fans and I doubt this becomes a good option. This is another non-starter for me. It certainly makes sense given the space and lack of development that’s occurred out there to this point. However, the city, county and state have a vision for this land and it has nothing to do with a football stadium. While I previous advocated for this spot, I’ve come around to agree that it will serve the city far better if utilized as park space with the potential for future development to grow organically. Even the most ideal mixed-use, stadium development plan likely won’t justify the acres of Outer Harbor land it would occupy. I’ve spoken to bloggers from Kansas City and Green Bay – two cities whose teams undertook large renovation projects – and the large-scale renovation option for Ralph Wilson stadium makes a lot of sense. Not only would it come in at a fraction of the cost of a brand new stadium, it would bring the Ralph up to the standard of the rest of the league while keeping the Bills out of the inevitable red tape and obstructionist nonsense that will come with trying to build a stadium downtown. Fully enclosing and updating the concourses while providing a modern facelift to the exterior could accompany suite and seating improvements that would likely right-size the stadium more than it is now to ensure it has the bells and whistles that define most of the stadiums around the league. Avoiding blowback from obstructionists and community activist groups alike would likely allow this project to progress quickly once a new owner is in place. This is more of a pipedream than anything else, but this site made an appearance in a recent News article and it’s something I’ve discussed (over a few beers, of course) with a number of friends. The Perry Projects are a blighted collection of pillbox buildings that are beyond uninviting and clearly need a facelift. With the Federal funding that was expected to kickstart a revitalization project gone elsewhere, I’m not sure what type of timeline this neighborhood has to see any sort of improvement. It also happens to occupy a large swath of land that, if developed differently could connect with the neighboring Cobblestone and Canalside districts. Simply uprooting the residents of this area to build new toy for a billionaire is foolhardy, shortsighted and would never win support. However, when you consider the growing number of vacant properties in the city, there’s no reason to think that these residents couldn’t be relocated to a new, respectable housing project in another area of the city. Taking the individuals and families out of the sorry looking pillboxes that they reside in currently and moving them to new digs that would provide them an improved quality of living would be a vast improvement over the neighborhood they live in now while also occupying a large number of the city’s empty lots. Yes, it would also erase a large enough footprint to provide space for a new stadium and additional development. That final option is truly a pie-in-the-sky plan, but it’s something I see as not only benefiting the crowd that only cares only about the Bills future but also helping to reinvigorate more than blighted neighborhood throughout the city. Hopefully we see a resolution to the ownership situation in the very near future so the fate of the team can be put to bed once and for all. A new owner would mean we could devote all of our Bills-related energy on worries about the quarterback, Kiko Alonso’s absence and where and when a new stadium might be built.